Our main products include Wholesale, multi-colored household candles for decoration. Our colors are: white, black, green, yellow, blue... any color you can choose. Our characteristics are dripless, smokeless. Our products have been exported to Africa, Mid-east, Central and South America, Asia, some European countries, such as Nigeria, Congo, Angola, Namibia, Guinea, Ghana, Benin, Cameroon, Sudan, Lebanon, Yemen, South Africa, Zimbabwe, Gambia, Senegal... Pakistan, Israel, Turkey, Haiti, Costa Rica, ect more than eighty countries. LITBRIGHT production capacity: 4x20' of White Household Candles per day. 4) Weight: 7g,11g, 20g, 22g, 25g, 28g, 30g, 35g, 38g, 40g, 45g, 48g, 50g, 55g, 62g, 70g, etc. 6) Can use customer's own brand. We could produce the candle according to your specification. 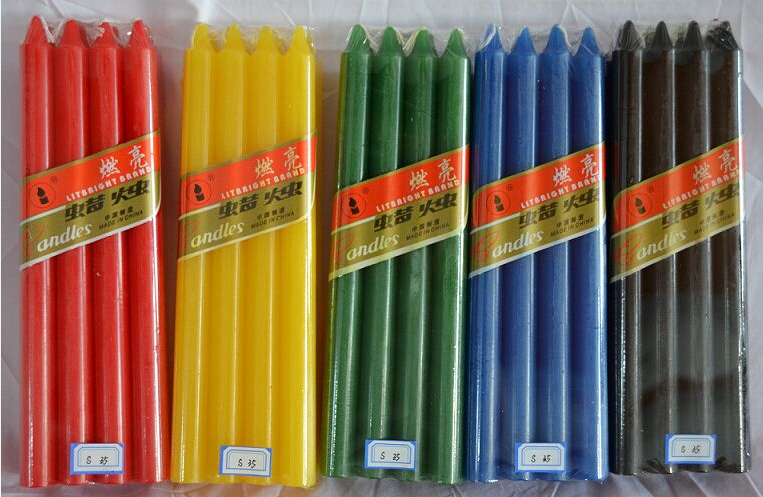 Multi-colored household candles for decoration, Our characteristics are dripless, smokeless, odourless, high melting point(58°C-60°C). Our household candles have many different grammers and many different sizes, the grammers are from 7g to 100g, the diameter are from 1.1cm to 2.5cm. Contact us if you need more details on Candles Making Kits No Tears No Smoke. We are ready to answer your questions on packaging, logistics, certification or any other aspects about Multi-colored Straight Candles、Pillar Candle for Household Candle. If these products fail to match your need, please contact us and we would like to provide relevant information.